As I grew up around the Binghamton and Syracuse, NY regions I have always considered Upstate NY to be Binghamton and everything north of it. When I went to college I would find myself arguing with other students (who probably have higher paying jobs than I do) about what qualifies as Upstate NY. Kids that were raised in Manhatten, Queens, Brooklyn, and so forth would try to convince me that Westchester, White Plains, and Nyack were Upstate NY. That rationale was always a bit upsetting as it implied that New York City was the only valuable part of the state and that everything else could just be quantified into one simple term: Upstate. Superintendent Chalmers sits at the dining room table awaiting Principal Skinner to bring in dinner in which he was promised steamed clams. Principal Skinner bursts into the room with a large platter of Krusty Burgers and proceeds to serve Superintendent Chalmers his dinner. By analyzing this conversation we can determine a few things about how Chalmers and Skinner dissect New York State. 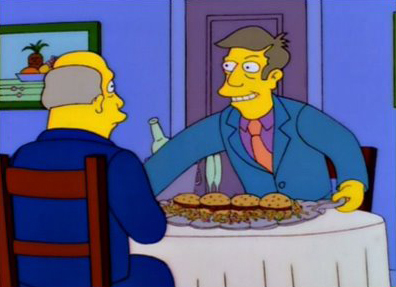 Once Skinner mentions that the term “steamed hams” originated in Upstate New York Chalmers instantly interjects with his being native to Utica NY (about one hours drive directly East of Syracuse). Skinner does not actively negate Chalmers’s belief about Utica being considered Upstate NY but chooses to shift his attention to another city, in this case Albany (two hours south east of Syracuse but located two hours north east of Binghamton). It is important to note that Skinner is attempting to be deceptive during this conversation but even with this deception he chooses to acknowledge Albany as Upstate despite the fact that it is located only one hour south east of where Chalmers has claimed his old stomping grounds. Through Skinner’s deception he had the opportunity to argue as to what was considered Upstate by mentioning another city such as Poughkeepsie but instead chooses Albany which is a city that Chalmers would have had a much higher chance of visiting. As Albany is so closely located to Utica, Chalmers has a higher chance of having visited there and thus a high chance of understanding the dialects that originate from Albany. Despite this possibility Skinner takes a chance and states that it originated in Albany rather than determining another possibility for what could be considered Upstate New York. With that basic logic in mind, I believe that the writers of 22 Shorts Films About Springfield have proven my theories on Upstate New York being considered Binghamton on up. Though Binghamton is not mentioned and the southern most point that is considered is Albany I believe that my point is still explained in some fashion. If Albany is considered Upstate then Syracuse, which is slightly North of Albany, must also be considered Upstate. Since Skinner chooses to not mention a town more south than Albany I believe this proves that towns geographically south of Albany are to be considered Downstate which would include White Plains, Westchester, and Nyack. If the group that has determined what qualifies as a dysfunctional family in the 20th and 21st centuries believe my theories on Upstate NY then I’m sticking to them. 1)I have started writing academic papers again for the first time in about five months and my brain is re-orientating to that process. 2) Sir Arthur Conan Doyle and his Sherlock Holmes short stories have been tromping around my brain for the past few weeks. Syracuse is the base of the state of New York. It is the most central location. Well technically in between Syracuse and Utica. It is Central New York. Therefore the geographical layout of the state should revolve around proximity to Syracuse. Meaning that Binghamton and Ithaca should be considered downstate as well as anything to the south of them. Southern New York would be another appropriate name. Buffalo, Niagra Falls region and possibly Rochester could be considered Western New York. Ogdensburg, Massena, Watertown would be Upstate or Northern New York. Albany and Troy are sort of stuck between central and downstate but they’re also further away so maybe call them Eastern New York.